Out of all the tooth replacement options, dental implants have the functionality, feel and appearance of natural teeth and are the standard of excellence against which other tooth replacement options are judged. A dental implant keeps bone intact and can prevent both bone loss and gum tissue shrinkage, thus protecting surrounding healthy teeth. Bridges and dentures provide the aesthetics, but not the support and protection provided by implants. And because a dental implant also replaces the root structure, the jawbone is better preserved. In terms of hygiene, a dental implant is much easier to clean as compared to a bridge. The teeth that support a bridge can develop cavities presenting the risk of failing. Well-maintained bridges can last a long time, but an implant often lasts a lifetime as it is not affected by cavities. Schedule an appointment with Dr. Durga at DD Family Dentistry if you want to learn about the options to replace one or more missing teeth. Below is a partial list of implant options that we provide to our patients at DD Family Dentistry. Restoring the entire tooth both roots and crowns means that your implant supported restoration is completely self-supporting. You don’t have to worry about potential damage to surrounding healthy teeth and oral structures, ensuring a healthy smile. The implant posts that replace tooth roots also offer a more natural level of function, allowing you to eat all of your favorite foods, ensuring a healthier diet. 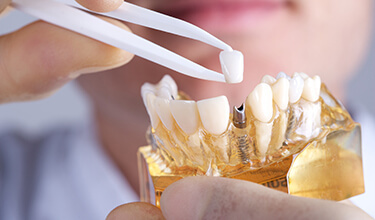 Traditional tooth replacement options like bridges and dentures need to be replaced every five to ten years, but implant supported restorations can last twenty years or longer with proper care. In fact, implant supported restorations have a 90 to 95% success rate after twenty years. Replacing both the roots and crowns of teeth, implant supported restorations look, feel, and function more like your healthy smile, making them a cosmetically superior option for many patients. Removal of a single damaged or decayed tooth results in a loss of both the visible part of the tooth (crown) and the root. In such cases, Dr. Durga inserts a dental implant into the jawbone which can fuse with the natural bone and become a strong and sturdy foundation for a replacement tooth. A small post called an abutment is then attached to the implant, and a replacement tooth (that is customized to match with the remaining teeth) is cemented on top of the abutment. 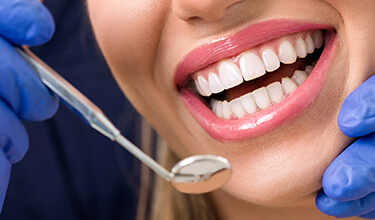 Your new implant tooth will look and function like a natural tooth allowing you to enjoy normal activities such as eating, talking and smiling. Dental implants also prevent the shifting of teeth that can occur in a person with missing teeth where the remaining teeth tend to shift positions towards the gap due to bone loss, affecting how the upper and lower teeth meet. Dr. Durga Devarakonda offers dental implants to patients who have lost multiple teeth due to trauma, periodontal disease, and decay. Implant-supported fixed bridges are permanently fixed to the bone in the mouth, so they are more beneficial than other options to replace multiple teeth loss such as traditional, removable dentures. Fixed bridges are anchored to two implant posts, one at each end. Partial dentures can also be anchored to implant posts, typically two to four implants, to fill in the gaps in your smile. Traditional dentures often leave patients with slipping, sliding smiles and a lack of confidence. Implant supported dentures don't slip or click, and there is no worry about them moving or falling out when speaking, eating, or participating in activities. Since they’re supported by four to six dental implants that are placed directly inside the bone, these dentures help preserve the jawbone and prevent bone deterioration and loss. Dental implants look, feel, and function like natural teeth, and can last a lifetime. People with dental implants say they look better, feel better and more confident, and they can finally eat what they want, and participate in all the activities they desire. DD Family Dentistry offers All-On-4 dental implants for people who have lost or are about to lose all of their upper and/or lower teeth. We place a full-arch (top or bottom set) of fixed replacement teeth stabilized using four dental implants. The All-On-4 implants are placed in available bone, precluding the need for bone grafting. We use special abutments which allow the placement of a temporary set of replacement teeth the same day. We recommend a modified diet while gum tissues heal, and the implants integrate into the surrounding natural bone. We place the final denture about six months later, and the patient can then return to normal diet. All-On-Four dental implants can be cleaned and maintained just like natural set of teeth. This is in contrast to dentures that require removal at night, messy adhesives, the potential for denture slippage during speech and smiling, bad breath associated with wearing dentures, etc. The final part of treatment planning is budgeting for the cost of your dental implant tooth replacement plans. Each part of the treatment process will be billed for individually to allow you to split the price of treatment up over several months. You’ll need to take into consideration the price of any preparatory tooth extractions or tissue grafts, implant placement, abutment attachment, and the final tooth replacement prosthetic. We’ll walk you through every step of the process, discuss out of pockets costs, and help you plan ahead. 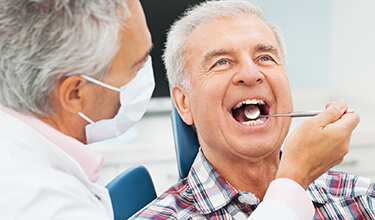 When possible, we’ll be happy to process and file dental insurance claims to help you make the most of your benefits. We can also work with third party financiers to provide low and no interest financing options. When budgeting for implant tooth replacement, it’s important to remember that this investment delivers a lifetime of healthy, natural looking smiles. Although dental implants offer exceptional benefits, it is a big decision to make. You are certain to have plenty of questions about the treatment to ensure it is the right option for you. We take the time to explain the process while addressing any concerns you may have. We will give you the facts you need about dental implants to help you make the right choice for your smile.